Thanksgiving rolls around once a year, and it's a great time to create decorative items in honor of the season. 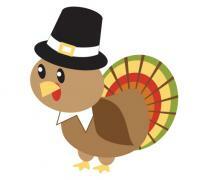 You can use free clip art to embellish your creations and Thanksgiving craft projects. To use the clip art, right click and hit "save as" to save the image to your computer. Thanksgiving icons like pilgrims, turkeys, cornucopias, and food all make great images to use in your creations. 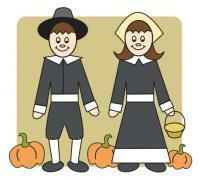 Pilgrims are commonly depicted in Thanksgiving-related images. The pilgrim girl stands in the middle of the symbols of fall, while a pilgrim boy and girl carrying a pail are preparing for the festivities. 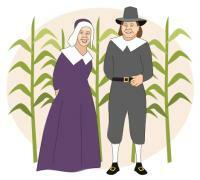 The realistic couple stands in a cornfield awaiting festivities. Nothing says Thanksgiving like a plump turkey wearing a pilgrim hat with a plume of colorful tail feathers. 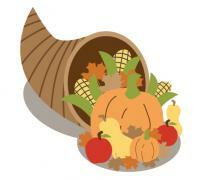 Pumpkins, corn, apples, and squash pour out of the cornucopia, all traditional harvest symbols of the season. 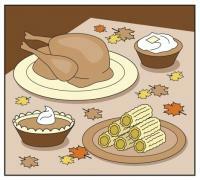 No set of clip art for Thanksgiving is complete without food! The Thanksgiving table is set with the holiday meal of hot turkey, mashed potatoes, corn, and pumpkin pie. 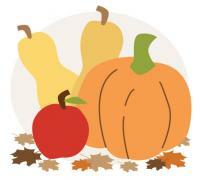 A seasonal palette of fruits and veggies includes apples, a pumpkin, and squash. If you have a specific clip art you're looking for, or don't find what you need here, check out some of these other sources for free Thanksgiving clip art. WebWeaver's Free Clipart: The site offers everything from silhouettes of Indians and Pilgrims to animated clip art. You can find two full pages of options. One page is full of different types of turkeys. 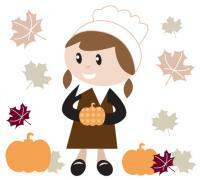 Hella's Multimedia: You can find 25 pages of Thanksgiving clip art to choose from on Hella's Multimedia. In addition to clip art, you can find borders, backgrounds, and lines. 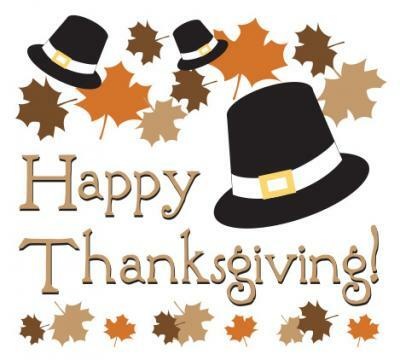 Thanksgiving often means family festivities, craft projects, or reasons to celebrate with family and friends. Free clip art is the way to go for all of your holiday creations.